How Big Does a Leyland Cypress Get? A fast-growing evergreen tree, the Leyland cypress (X Cupressocyparis leylandii) is an attractive landscape tree that grows 60 to 70 feet tall and 15 to 25 feet wide in a pyramidal shape. The Leyland cypress grows best in full sunlight exposure and in USDA Hardiness Zones 6 through 10, enjoying hotter summers and milder winters that don't experience temperatures colder than -5 degrees Fahrenheit. Leyland cypress trees can look very similar to other coniferous trees, but studying its leaves helps to make a positive identification of the correct tree species. Notice the leaf type to identify the Leyland cypress. This tree has scale-like foliage that’s evergreen and has needles in flattened sprays of “branchlets” along the stems. Identify Leyland cypress leaves by how they’re arranged on the stems. Leyland cypress trees have needle-like leaves that are arranged opposite each other in pairs along the stems. Look at the color to spot Leyland cypress leaves. Leyland cypress trees have soft-green needle leaves that turn bluish-green to dark blue-green as the tree matures. Study the length of the scale-like leaves. Leyland cypress trees have leaves that are less than 2 inches long, fine and feathery with pointed needles. Cut overgrowth using pruning shears. Reduce the plant by up to one-third of its height to encourage dense, healthy growth. Discard the pruned material, and pull out any vines that may have entangled the shrub. Trim smaller stems using hedge trimmers, fine-tuning the shape as you work. Keep the base of the plant wide so light reaches all parts of it. The plant should narrow as it goes up into a flat-topped A-shape. Choose a spot in your yard for a Leyland cypress. They prefer full sun. Soil type does not matter, as the Leyland cypress can tolerate most soil varieties. Plant your Leyland cypress in the fall. Dig a hole about three feet deep and two to three feet wide. Place the root ball in the hole and firmly fill with soil. While the tree is young, water your Leyland cypress two times a week for ten minutes each watering. Once it is established, water it once every two to three weeks for ten minutes each watering. Fertilize your Leyland cypress in the spring and fall with one cup of water soluble 10-10-10. Prune your Leyland cypress in the spring and fall. Remove any over reaching or dead branches and trim to your desired shape. Most Leyland cypresses are trimmed in a columnar shape. Proper soil conditions ensure that Leyland cypress will achieve maximum growth, full branching and structural strength. Good soil preparation ensures a deep, strong root structure, maximizing the chances that this often shallow-rooted tree stays firmly in place. Leyland cypress is well-suited to many soil conditions, tolerating clay, sand and either alkaline or acidic soils. In loose soils, the tree will benefit from the addition of a clay-based topsoil. Leylands planted in heavier soils are more likely to stay in place during high winds than those planted in loose, sandy soils. Leyland cypress’ capacity to survive drought is good, but consistent moisture will produce a faster-growing plant. Sandy soils amended with compost will improve water retention. During dry spells, water deeply and less often, rather than shallowly and often, to promote deep root growth. Mulching retains moisture and shades roots. Leyland cypress’ need for nutrition is not great, but it still benefits from a light application of evergreen tree fertilizer in late fall to promote fast growth, good branching and strong root growth. Mulch should be replenished each spring so soils do not dry out. Leaf mold or compost can be used as mulch to retain moisture and nourish trees as it breaks down. Find the central leader at the top of the Leyland cypress tree. This is the main vertically growing branch, usually in the center of the tree. Cut off the central leader with the lopper pruner, removing approximately 4 inches of height from the branch. Shear the outside edges of the Leyland cypress after trimming the central leader. Remove up to 4 inches from the outside edges of the tree with the hedge shears. This shearing will keep the tree growing in uniform balance between height and width. Spray the entire tree generously with the fungicide spray immediately after pruning to prevent fungal infection while the tree recovers from the pruning. Repeat the spraying every week for six weeks. 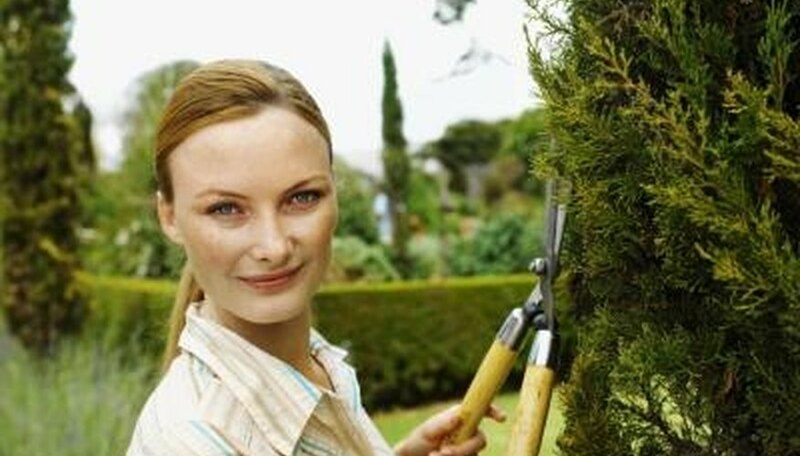 Repeat the entire pruning process twice per year in the spring and in the late summer. Apply a granular slow release fertilizer in either a 9-month or 14-month release period formula. Sprinkle the fertilizer around the roots area and out at least a foot past the drip line of the cypress. Lay down the fertilizer in the early spring to provide year-round feeding and repeat when the release period has concluded. Use the amount recommended on the package label for the acreage to be covered. Feed leyland cypress with an organic fertilizer, such as fish emulsion, to supplement the work of chemical slow release fertilizers by adding micro-nutrients and stoking microbial action in the soil. Apply according to the package directions at least twice, and up to six times, a year. Water in each fertilizer application deeply to mix with the top soil and begin the percolation process of nutrients down into the soil. Keep the soil around your leyland cypress lightly moist to moist at all times and do not allow the soil to become parched. According to the United States Forest Service, Leyland cypress trees reach a height of 50 feet in the western United States, and grow somewhat shorter in the eastern United States. These trees grow 3 to 4 feet per year and have a spread of 15 to 25 feet. While Leyland cypress trees aren't native to the United States, they can be found throughout the western and eastern coasts and in the southern central states. Leyland cypress trees are hardy in USDA zones 6 to 10A. Leyland cypress trees can grow in either full sun or part sun. They tolerate a wide range of soil conditions, including either acidic or alkaline soil, and can withstand salty soils. Leyland cypress trees are drought-resistant. Leyland cypress trees display soft green needles with a feathery texture. They do not flower, but they bear tiny brown fruit less than 1/2 inch in size. Bagworm can strip a Leyland cypress of its foliage within a couple of weeks. Trees that have suffered drought may develop a canker; this occurs primarily in California, according to the United States Forest Service. Leyland cypress trees can experience foliage fungus. Measure the diameter of the Leyland cypress tree. Note the measurement in inches. This will guide you as to how much fertilizer your tree needs. Sprinkle a time-release granular fertilizer with an NPK of 10-8-6 around the Leyland cypress tree. You will need 1 lb. of fertilizer for every inch of tree diameter. For example, a Leyland cypress tree with a diameter of 8 inches requires 8 lbs. of fertilizer. Rake the granular fertilizer to mix it 1/4 inch deep into the soil. Water the fertilized area of around the Leyland cypress tree. Watering the fertilizer helps it seep deeper into the soil so that it can be utilized by the tree's roots sooner. A Leyland Cypress can get as big as 60 to 70 feet when fully mature. The spread of the tree ranges from 15 to 25 feet. Place moist peat moss in the plastic bag. Make sure that the peat moss is moist and not soaking. Place the seeds on top of the peat moss and cover with another layer of moist peat moss. Seal the bag and place it in the refrigerator for at least 10 weeks. Check the moisture level of the peat moss periodically and add drops of water if it is too dry. Pour the seedling mix into the planting tray and water it well, allowing the excess water to drain from the bottom of the tray. Plant the seeds 1/2 inch into the soil and cover lightly with soil. Place the tray in an area that receives bright light, but not direct sunlight. The amount of water the seedlings receive is very important. Too much and too will kill the seed. Maintain a moist, not soggy soil. The Leyland cypress tree has a shallow dual root system. The main roots spread out approximately 40 feet, with the minor roots extending 67 feet or more on a fully grown Lyland cypress tree.